Over the weekend I was kept busy competing in the NSW Ceroc & Modern Jive Championships, but yesterday afternoon/last night (in spite of being totally knackered by aforementioned dance comp) I managed to finish one more image. The model’s choice of clothing, the background, and the candle combine to create a painterly and almost-fantasy feel to this image. I think having a foreground element – like the rock on the left of this image, or the park bench behind the subject in “I Forgot…” – makes a big difference in reducing the appearance that the models have been Photoshopped onto a background. I’m thinking of adding a railing behind the image with a view over the Blue Mountains; and some other forground element behind the forest image, to see if these (compositionally) tie the last two images together more. 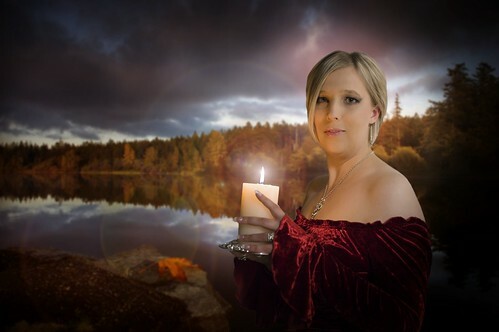 Lighting: Subject was lit by candle; a tall, diffuse soft box was used on the right for fill so that the light from the candle wouldn’t seem to harsh on the subject’s face. The original capture colours were tweaked a little during post-processing to reduce the difference in light temperatures between the candle flame and the tungsten fill light. ~ by Q on June 9, 2009.